Aspose.Total, Aspose.Cells, Aspose.Words, Aspose.Pdf, Aspose.slides, Aspose.Pdf.Kit, Aspose.BarCode, Aspose.Network, Aspose.OCR Hong Kong/Asia Distributor, Reseller | Cogito Solutions Ltd.
Aspose offers components for many different platforms - .NET, Java, Reporting Services, JasperReports and SharePoint, and for each platform along with the various components we also offer an Aspose.Total package which is a compilation of all components offered by Aspose for that particular platform. The Aspose.Total Product Family Pack simply combines all of these Aspose.Total packages into one pack providing you greater convenience and affordability. 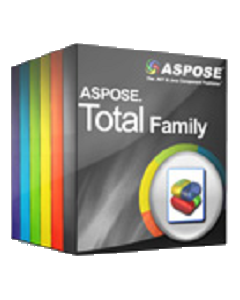 With the Aspose.Total Product Family Pack you can easily develop robust applications for .NET and Java platforms as well as export your reports to variety of different formats from Microsoft SQL Server Reporting Services and JasperReports and convert your documents to various formats within Microsoft SharePoint applications. Using Aspose.Total for .NET developers can create a wide range of applications, each leveraging the combined power of all Aspose .NET components that are included as part of the Aspose.Total for .NET suite. Understanding the very unique needs of Microsoft SQL Server developers, Aspose has introduced Aspose.Total for Reporting Services, a suite of 5 unique Rendering Extensions for Microsoft SQL Server Reporting Services. Using these rendering extensions, developers can easily export their RDL reports to Word, Excel, PowerPoint and PDF documents. Understanding the very unique needs of JasperReports developers, Aspose has introduced Aspose.Total for JasperReports, a suite of 4 unique JasperReports Exporters. Using these exporters, developers can easily export their JasperReports reports to Word, Excel, and PowerPoint documents. Also, it includes the possibility to add Barcodes to exported documents. Does your organization have a corporate document depository on Windows SharePoint Services (WSS) or Microsoft Office SharePoint Server’s (MOSS) technologies? Do you have to use multiple document formats in your internal work process or in your interaction with customers and partners? Yes?, then Aspose.Words for SharePoint will help you to distribute corporate knowledge by allowing users to convert files held within SharePoint into the formats your users need them in. Aspose.Cells for SharePoint is a flexible spreadsheet manipulation solution that allows users to convert MS Excel documents within Microsoft SharePoint and support multiple document formats beyond the native supported formats. Aspose.Cells for SharePoint will help you to distribute corporate knowledge by allowing users to convert files held within SharePoint into the formats your users need them in. Aspose.Slides for SharePoint allows you to read and convert PowerPoint files in a SharePoint application without using Microsoft PowerPoint. It is aimed at SharePoint developers that need to convert various PowerPoint file formats to PDF, TIFF or XPS formats without losing fidelity.